Antique china dinnerware, antique dinnerware, vintage dinnerware, and collectibles are often confused by collectors - both buyers and sellers. Personally, I don't claim to be an expert of defining which category they all fit into. In fact, I have found that not even the "experts" agree on the subject. Basically, the term "antique" describes items that are fifty to one-hundred years old, are collectible and are rare or unique. Antique items have also been described as works of art created before 1830. Some people just say if something is old, it is an antique but that definition can vary from age group to age group - just ask my kids who think that cassette players are antiques! Vintage is a word that is used to describe things of high quality from a past time. Usually vintage items include a year or time period in the description. Collectibles are basically items that people collect that are of some monetary value. 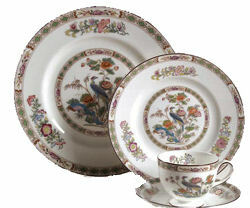 Limoges dinnerware, for instance, is a collectible item. Limited edition collectibles are manufactured in limited quantities which can add some significance to collecting them. Some collectibles lose value shortly after production because they are simply a fad while others remain in demand and grow in value. Wedgwood dinnerware is a great example of a manufacturer whose products might be considered antique, vintage or collectible dinnerware. The company was founded in 1759 and has been producing vases and dinnerware ever since. 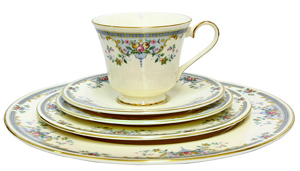 Of course, the first production of bone china in the year 1812 would be considered antique china dinnerware. Many of their product lines would be considered vintage dinnerware and the Martha Stewart Collection is available through the company and it is definitely considered collectible dinnerware. 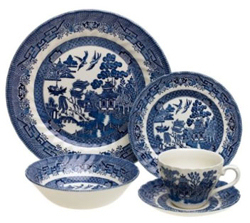 Blue Willow china is an example of a pattern that can range from different eras. The original pattern was designed in the late 1700s and has been reproduced by several manufactures. Toile Dinnerware is another example. Shopping for Collectible, Vintage or Antique Dinnerware? Collectible dinnerware that is currently in production is pretty simple to find. Some patterns may be sold new only by an exclusive store, especially limited editions. Antique china dinnerware, vintage dinnerware and antique dinnerware may be harder to find if you are looking for something specific. Many people collect a particular pattern for years before they complete the set. That is part of the thrill in shopping for antiques. The excitement is surreal when a collector finds a piece that they have been looking for. People who have a full set of collectible, vintage or antique dinnerware often need to find replacements to replace broken or chipped pieces. The hunt for individual pieces and replacements used to involve going to antique stores, garage sales, auctions, estate sales, and so forth. Since the introduction and grown popularity of the internet finding items to complete a set has become so much easier. There are online auctions, replacement companies and original manufactures that offer the opportunity to purchase complete sets or replacement items of retired product lines. If you are shopping for antique items, vintage dinnerware or collectibles it is important to know how to identify and value antique dinnerware. Most commonly marks and signatures are used to determine the age of the item when it comes to dinnerware.